Newer strategies in treating joint osteoarthritis (OA) are emerging. A group in Spain is taking regenerative medicine to a whole new level and are seeing great improvements. They are seeing increased pain reduction, improved function and higher activity level with their patients. Based on their pioneering work, we are proud to be the first regenerative medicine group in Montana to provide this treatment. Most “Stem Cell” or “Regenerative” treatments for knee OA involve injecting one or more biologic components into the arthritic joint. These components include Platelet Rich Plasma (PRP), Placental Tissue Matrix (PTM), Adipose Graft (AG), Bone Marrow Aspirate Concentrate (BMAC), or Umbilical Cord Blood (UCB). We typically see good results using these different regenerative options when treating the surface structures inside the knee. However, we are neglecting the supporting structures underneath the cartilage. With OA, these structures are breaking down and creating pain. In other words, simply treating the joint synovial fluid with an intra-articular injection does not address the structural foundation of the joint. Making up the joint surface, there are chondrocytes (cells that make cartilage), hyaline cartilage and a few mesenchymal stem cells. These mesenchymal cells create and maintain an abundant protein-rich environment. This provides for an elastic, smooth-gliding and frictionless surface. The joint surface is a highly specialized functional structure. When healthy, it maintains efficient lubrication as well as dispersing of weight bearing forces to the joint. A healthy joint surface is critical for pain free movement. Chondrocytes account for only 1–5% of the volume of hyaline cartilage. They are responsible for maintaining balance to the tissue matrix of the joint surface. Chondrocytes metabolize quickly and very effectively respond to weight bearing loads with shock absorption. However, these cells do not reproduce in normal conditions. So, our bodies are continually remodeling the joint surface environment to maintain balance. Because of this, steroid injections alone can result in further cartilage break down and worsening OA. The steroid disrupts the chondrocytes’ ability to maintain a healthy joint surface environment. We know steroid injections do provide temporary pain relief by decreasing inflammation in the synovial membrane. But, they also decrease the ability of chondrocytes to maintain healthy cartilage. So in reality, these injections alone increase the likelihood that you will need surgery down the road. Below the joint surface and cartilage is subchondral bone. Subchondral bone forms the cartilage base which supplies the joint surface with blood, oxygen and nutrition. 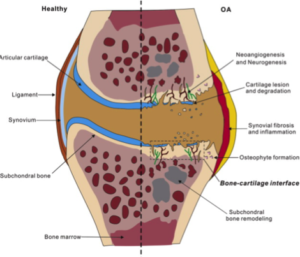 Together the cartilage and subchondral bone make up an osteochondral functional unit. The osteochondral functional unit is critical for shock absorption. With OA, the subchondral bone undergoes many changes. Some of these changes include micro cracks and structural defects as well as an ingrowth of nerve tissue. The nerve tissue is allowing the direct transport of growth factors and inflammatory cells. Therefore, over time, this ingrowth of nerve tissue is primarily responsible for pain and inflammation associated with OA. Traditional intra-articular injections alone with regenerative therapy do help address the surface layer of cartilage, but do not address the critical subchondral bone or osteochondral functional unit. As cartilage has no pain receptors, the pain felt in walking with OA is associated with the subchondral bone. Therefore, to adequately address OA and the driving force for pain, the subchondral layer must be targeted. Since most regenerative treatments do not adequately address the subchondral bone, sub optimal results are being seen in intra-articular joint injections. Here at PICSM, we address the subchondral bone by injecting Platelet Rich Growth Factors (PRGF) into it. This is called using an intra-osseous approach. The regenerative group in Spain has done over 5000 cases combining both intra-articular and intra-osseous injections and they are seeing superior results! By targeting the subchondral bone during an intra-osseous injection, we are helping to restore the structural base of the cartilage. Thereby bringing more nutrients and oxygen to the joint surface. Using this newer technique, we are providing regenerative treatment for joint OA that is superior to any other clinic in Montana. While other regenerative therapy options are available in our region, we are the only Montana based clinic that currently addresses the subchondral layer.